A few weeks back we had another Xangan visitor, this one David from London. He and I did a day trip down to the evening floating market in Amphawa, which was written about in this entry. After he went to Phuket for several days of relaxation he returned to Krungthep and Tawn and I met him for drinks and dinner. We had eaten at Zense before with another David (this one from Singapore) and his partner Chor Pharn, so decided this time to stick with drinks only before moving on to the Italian restaurant at the Amari Watergate Hotel for dinner. Zense is located on the 17th floor of the Central World Plaza mall, above the Zen department store. It is one of several new restaurants that are either on rooftops or offer elevated, outdoor dining areas. The view looking west (above) is quite nice. 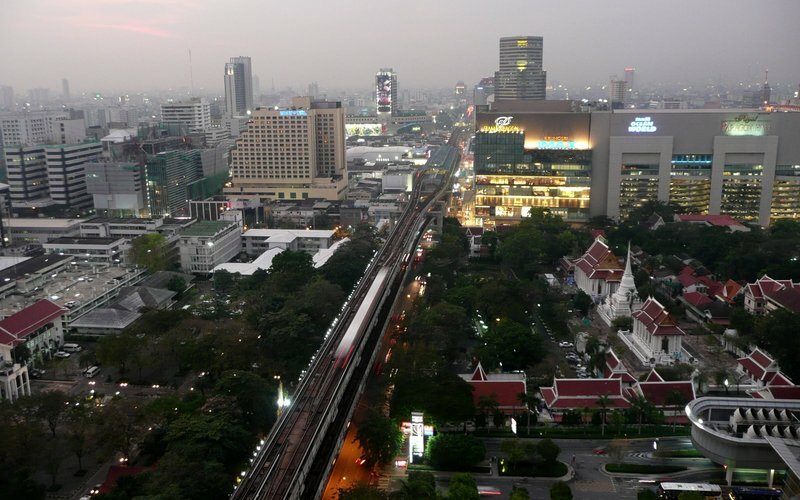 You can se the police headquarters (low buildings on the left), the Novotel hotel in Siam Square (tan building with blue sign left of the train tracks), the Skytrain Sukhumvit line, the Siam Paragon mall, and next to it – squeezed between Paragon and Central World Plaza – Wat Phatumvanaram. This temple is worth a visit as it makes for a very tranquil oasis in the midst of Krungthep’s shopping district. Looking out from the temple grounds to the surrounding structures gives one a sense of the contradictions that are a part of life here. 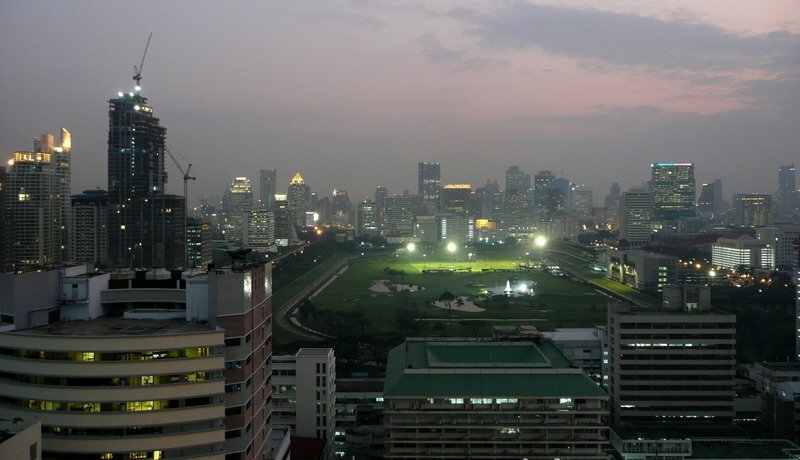 Looking south, you look beyond the police headquarters and police hospital (tall building in the immediate left foreground) towards the Royal Bangkok Sports Club – one of only two horse racing tracks in the city – and beyond that, the Sathorn and Silom business district. The tall buildings under construction on the left are at Ratchadamri Station, a very popular area for short-term expats teeming with many new high-rise service apartments and hotels. Turning around and looking overhead, the top of the Central World Plaza building has this interesting fiberglass structure that looks like a waterslide and changes color every few seconds in a slow process that is mesmerizing to watch. 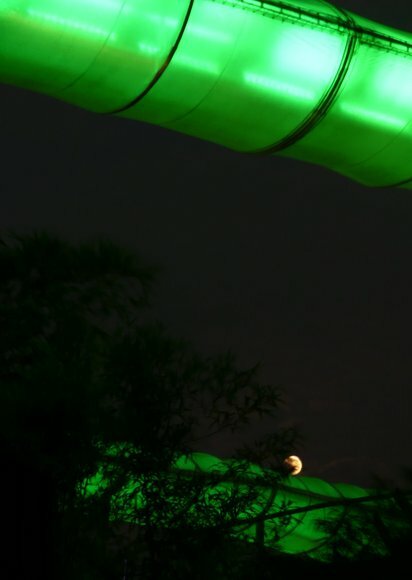 Peeking out from behind this structure is the full moon. Our dinner at the Amari Watergate was pleasant and the food was good, but the lighting was not conducive to taking pictures. 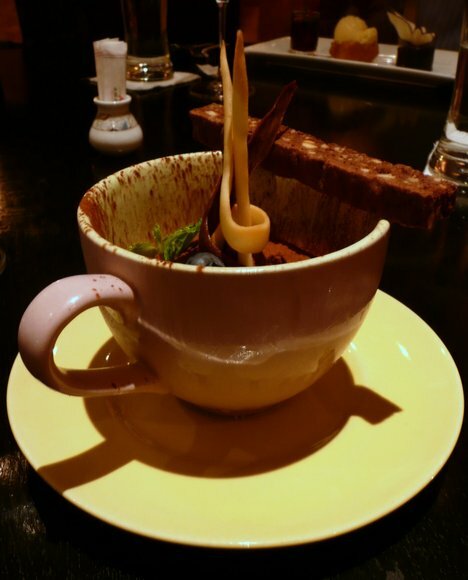 The only shot I managed that was worth sharing was this one, of my “tiramisu in a teacup” that was my dessert. This entry was posted in Uncategorized and tagged Bangkok, Central World Plaza, Krungthep, Skyline, View, Zense by christao408. Bookmark the permalink. The first shot is so interesting- the temple complex looks really gorgeous. The tiramisu however, kinda looks ugly and very uninviting- so not how a dessert is supposed to look! wow amazing view.. i would love to boink a girl there. omg tiramisuuuu… there’s this one place where I get tiramisu icecream, that stuff is heavenly.. i like the first picture of the view the best. beautiful.. must have been a splendid dinner. I’ve never met anyone on xanga before, but my oldest xanga friend and I have vowed to meet if she ever comes to Pune or if I visit the US anytime soon.. what’s it like meeting a xangan? I’ve always been intrigued by the idea but also kind of creeped cuz maybe you’ll love the person on xanga but then they might be a completely different person in real life. have u had any funny experiences that way? @gweirdo – Yeah, the first picture was the best. I should have just left it at that but I know there are a few readers who are familiar with Krungthep and would like to see the other direction of the view. Meeting Xangans is kind of like meeting anyone else, I guess. In this case you have the benefit of some background beforehand and like most “blind dates” I make it a point to meet in a neutral setting, usually over coffee or a meal so there isn’t too much commitment.I’m been really fortunate – I’ve met at least two dozen xangans over the past few years and out of those meetings have developed some really good friends. In August when Tawn and I got married, we stayed with Andy and his girlfriend in Omaha. We hit it off so well that we met up with them in Taiwan in November for a long weekend sightseeing. I took a side trip to Quincy, Illinois to visit Zakiah and stay with her family. I route many of my trips to the US through LA to visit with Gary since he’s such a foodie, too! Last trip to NY I finally met a trio of Xangans I had been conversing with for a long time. So the experience has been good. @Made2Order – Oh, that would be pretty, um… disturbing to the other people dining there. @Dezinerdreams – The tiramisu WAS ugly… it tasted okay though. wow, what a view! that tiramisu looks delicous, and it reminds me that i haven’t made one in a while… hahaha. I was reading that your city has all kinds of rooftop bars and restaurants springing up these days, and I’ve seen a few of them. It’s a great concept I think, especially with the warm weather there. I love restaurants like those. Jacquie and I were recently watching an Anthony Bourdain episode in Thailand, where he visited a couple of floating markets. Have you seen that episode by any chance? One of them looked very similar to the one you did the post on. @arenadi – I haven’t seen that episode – which season is it from? @TheCheshireGrins – Oh, there’s one thing better: food with a view and a drink! @CurryPuffy – The dinner (which was at the Italian restaurant at the Amari Watergate) was about $120 for three people, including a bottle of wine. @kunhuo42 – A delay I trust you’ll fix soon? @yang1815 – @secade – Yes, it is. Nice photos! I always enjoy your tours. The dessert did not appeal to me. I’ve given up chocolate and my brain is screaming for it – so I didn’t fixate on the cocoa powder. brown. coating everything. looking thick on the top. aaaahh! What’s the white/cream twirling thing in the tiramisu? Looks interesting and hopefully tasty too. As always, wonderful pictures. I loved the shot of the moon. Tiramisu is my favorite dessert too. But I don’t think it likes me much…. the coffee in it keeps my awake almost the entire night. I was staring at that last picture for a while trying to figure why it looked odd. I finally noticed part of the cup is missing after looking way too long haha. Beautiful view of the town and I have to ask what is tiramisu in a teacup? that cup is only HALF full. you got ripped off, buddy. @rudyhou – Well, half full is better than half-empty…@styx_site – Tiramisu is an Italian dessert. Espresso-soaked “ladies fingers” cookies covered in marscapone cheese and whipped cream with a dusting of chocolate powder. http://en.wikipedia.org/wiki/Tiramisu@Roadlesstaken – Optical illusion brought to you by a chocolate biscotti. @lcfu – Well, you’ll be back, I’m sure!